Robin: artist, musician, performer, composer, teacher, mentor, writer, hilarious jokester, probing conversationalist, foodie, golfer, voracious reader and a most curious mind, has left us. Devoted husband to Eleanor, “King of the World” to his children Bryce and Dorothy, “Ogi” to his grandchildren Esme, Grayson and Lucie and father-in-law to Richard and Jill. Robin was a percussionist in orchestras across the U.S. and came to Canada in 1968 to join Seiji Ozawa as the principal percussionist of the TSO. In 1971, he was a founding member of the renowned percussion ensemble Nexus. He was inducted into the Percussive Arts Society Hall of Fame, he won a Toronto Arts Award and the Banff School’s Donald Cameron Award. He was a guest conductor for New Music concerts, Array, CBC, the Art of Time Ensemble, and for over 20 years he directed and conducted the University of Toronto’s contemporary music and percussion ensembles. 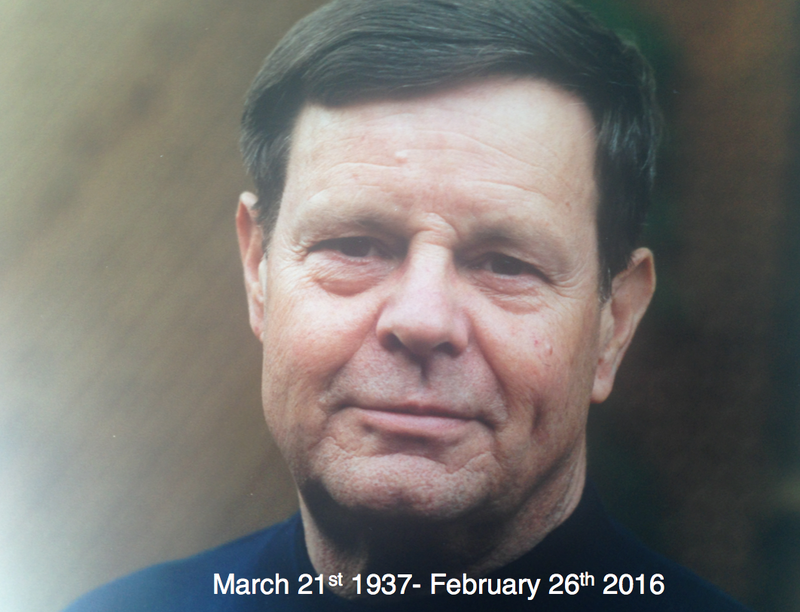 He was a teacher at the Eastman School of Music, York University and a leader of master classes around the globe. Robin was an avid writer and blogger on subjects ranging from “Winter Camping in Killarney” to the genius of Toru Takemitsu. That’s just a précis of the many threads of Robin’s storied, adventure-filled life. He had two essential qualities; an insatiable, fearless curiosity, and an unflinching, uncompromising sense of right and wrong. Anyone who ever shared a glass of wine or a meal with him understood this. He was ferocious in his pursuit to make sense of the world around him, engaging anyone and everyone who crossed his path, on any subject. “What do you mean?” he would ask. “When and where did that concept arise? How do you spell that?” Robin would then pull a dictionary, atlas or book (and later an iPad) off the shelf. But on Friday, February 26th the questions and inquiry stopped for the first time in 79 years as he floated off peacefully for what Eleanor has described as “his final tour.” He will be missed, but never forgotten by those he loved. There will be no formal funeral or services. In lieu of flowers, we ask you to consider supporting an arts organization you love in his honour. Dorothy Anne, Bryce, Jill, Richard, Esme, Grayson and Lucie would love to hear your Robin memory in the comments below. These comments have been wonderful to read. They all bear witness to Robin’s genuine, caring and fun-loving character. As a former U of T student, I too was lucky enough to be along for those terrific post-concert gatherings at your home. You and Robin were always impeccable and gracious hosts. They are wonderful memories for me. My first encounter wth Robin was kind of like sipping a lovely red wine too early, not having let it breathe enough, I guess. I, along with a few others, were thouroughly raked over the coals for not having our quintuplets together for the first rehearsal of a Lou Harrision piece. Needless to say, the smile on my face now as I write about it was no where to be found then in the moment! However, having been soundly chastised, Robin then proceeded to teach us how to break it all down in order to play our parts. That’s how I remember him at U of T, demanding but fair, then very appreciative when the work was done well. Other cherished memories are related to the visits that you, Robin, Stephanie and I took to the St. Lawrence market for brunch and food shopping from the Farmer’s market. Steaks, weisswurst, headcheese (that’s Stephanie’s!!) and the clincher across the road at the cheese counter: the “stinky-sock-under-the-counter-locked-up-in-the-barrel-only-for-the-bravest” cheese that he introduced us to, YUMMY! Not to mention the golf games we shared with my Dad. Excellent times! It was also very meaningful to meet you both over here in Finland when you visited in 2008. I am feeling saddened by the news of Robin’s death, however, I am also feeling incredibly blessed to have known him in the ways that I did. His life and work continues to make an impression on me, my family and my students. He had wonderful golfing times with you and your father. And our trip to Tampere was made all the more special by you and your family coming miles and miles to visit with us. I miss him dearly but there are lots of memories to hold onto. Please give my best to your parents. I was very sad to read your email about Robin’s final tour. I am glad his departure was peaceful and surrounded by you and the family. My musical memories of him stretch back to U of T when we performed Cage’s “A Flower” in 1992 in Walter Hall, as part of a memorial concert for John Cage. That was the first time we met, I think. Then came the ragtime tour with Nexus as well as Drumming with Nexus and Kroumata. And not least, he conducted me in the Hums and Songs of Winnie the Pooh (Olly Knussen) on my master’s recital. There was a terrible snowstorm that January and I have no idea how everyone managed to get to rehearsal but we did, and it was so much fun to put it together. He talked a lot about the Symphonie Fantastique. I learned a lot from Robin. Not least, that Gattinara is a very special wine and one must try it if its on the wine list in Jacksonville, Florida. And about punctuation! I think I have a book from him on the use of the comma, or is it the apostrophe? He is most surely a noun, but also a verb, an adverb, and an adjective (and sometimes, close to an expletive!). An Original. Once he somehow dropped by a singing lesson I had with Mary at the University, and was absolutely appalled at the way she was making me sing. It was hilarious. He kept saying to Mary, WHY are you making her sound like THAT? She sounds AWFUL! Dinners and drinks at your house (and on the road – several great ones in New York!!) were always special. The food (!!! ), the WINE (!!!) but even more, the way conversation went. His mind was downright scary, in the best sense. I was intimidated and inspired. Remember the dinner at Mary and Harry’s on Avenue Rd when I made lamb and Phil and Noreen were there too, and Lori, and Robin convinced them to start opening the wines they’d been carting around for years? None of which were much good anymore but, it was fun and very Robin, to instigate. And I am still laughing about the New Music Concerts fundraiser a year ago where he started drilling Paul Griffiths about the “humour” in Carter’s What Next? I thought…oh noooooooo! Here we gooooooo!!! And Dianne and Mike were trying not to crack up as he basically revealed the Emporer’s New Clothes, as he probably did more times than anyone could count. It was always the questions which were most important, rarely the answers, and alongside his beautiful creative spirit, his curiosity is what I hold most dear about him. Oh Barbara! Your letter is such a delight. I thank you for this as it brings back such good times with you. It was a huge disappointment to both of us that Robin was not feeling well enough to come to your fall concerts with the TSO. We have followed your career with love and admiration and I’ll continue to do so. I am so saddened and sorry for your loss. This past week as I have been sitting in lessons, rehearsals, CIM auditions and my masterclass last night at North Western with She-E, and I can not stop thing about Robin and how much I miss him. Samantha and I just met both of you a few short years ago and it felt like we’ve been friends for a lifetime. Since that time in Atlanta for the snare drum competition, we spent that weekend together in Toronto, and Robin and I had some correspondence over email which I have been going back over and reading this week. He wrote me a note at your 53rd wedding anniversary telling me about the dinner you had. It was pure poetry. I felt like I was there with both of you. Since our son was born 16 months ago I regret that we did not get back for a visit since the last time. She-E gave me some of the details of the last year. I am so sorry for the sadness and loss that you must be going through. If there is anything I can do or anywhere I can be please let me know what or where and I will do anything I am able. Robin had a giant impact on me. I felt like a little boy being invited into a club with a musical giant and person of such goodness. I didn’t know if I was or will be worthy of that “club”, but I will always have Robin with me in the practice room and performance, and of course think of him and toast him over a great bottle of wine. Please keep in touch and give yourself a big hug from me. How did it happen? You and Robin clicked from the very beginning of meeting each other in Atlanta. You certainly both shared a love of food and wine and I know he was so impressed with you and your musicanship. I too, have lovely memories of your visit to Toronto with Samantha. I hope to see you soon. Robin was a friend of mine since 1998. He supported me a lot. We met in Tampere (Finland), Fredonia (NY), Columbus (Ohio) and Toronto. All those visits will live on my mind forever. Robin’s impact to me is crucial. I send my warmest wishes to Eleanor and the whole family! Thank you Risto. Please give my greetings to Irrmeli. Such a lovely visit in Tampere, concert and that special dinner with all the percussionists. It is with sadness that we note the passing of our dear friend and colleague Robin Engelman last Friday. Our thoughts and prayers are with Eleanor and their family in this unhappy time. Please visit http://www.robinengelman.com to read the very moving tributes to this marvelous musician and wonderful human being. He will be greatly missed by all he touched. I love this photo! And I miss him! He was special and he made me feel special! I was really touched , that he wanted to be in touch with me during all these years! You both are such a warm people Eleanor! He even remembered Lilli’s birthday for so many years! And we have those books you sent for my daughters! I was glad I had a chance to spent time with you in Indianapolis in 2011. I was thinking, if I will ever see him again and I was happy I had that wonderful dinner with you, before you left. He sent me e-mails, cds and snare drum books and I got so many Christmas cards from you too! Always when he was in contact with me, I felf I was special! I got to know him in 1990 and reasently I understood he was not in that good shape, because I didn’t hear much from him. I noticed always when he wrote his blog though, and thought ” good he is still going strong!” I didn’t want to bother him too much, because I knew about his eye problems. But we had our beautiful Sibelius project! The link below is Sibelius song called Tryst. I sent it to Robin, because it is one of my favourites and Karita Mattila who is singing it, gives her everything. That is how I felt Robin did too. Esa-Pekka Salonen is conducting. Sami and Harri Lehtinen are also sending their condolences. Such lovely words about Robin. You were special to him too and I’m sure you know that. And we did hear a lot of Sibelius over the past few years! That visit to Tampere will always be a highlight – and hearing you play that night with the Tampere Orchestra. Do keep in touch. I did not have much contact with Robin, but then again just how much contact did you need to know Robin well? Such a blazing, phantasmagorical cornucopia of a personality…..Stars occasionally descend from the heavens and stay with us for a (too short) while. I am a flutist, but I met Robin through some lessons performing duets with percussionist and timpanist Lisa Simmermon. Lisa was at first looking for technical advice but Robin seemed more interested in what I would call “spherical musing”, and his mind would appear to leap from sphere to sphere in explaining musical ideas. Those two sessions, one at the farm with Russel Hartenberger present, and one actually on stage at Massey Hall with Robert Aitken listening in, were the greatest flute lessons of my life. His legacy will live on in the millions of spherical musical thoughts filling the air for a long, long time. I am grateful for my brush with the name Robin Engelman. What an amazing life and well lived! While my sincere condolences reach out to all of you, I can’t help but celebrate Robin’s life and his effect on the world of percussion and all of us! At the RPO Robin was always supportive of my work, encouraging me and inspiring me. I still remember that the highlight of the concerts was when he met Eleanor in the main hall at Eastman afterwards! A fabulous party in Toronto at the house by the Humbolt River, right after Robin became the principal percussionist in Toronto. Eleanor had an elegant and spectacular reception and Robin loved every minute of being the host and celebrating. At the “farm” another great evening with Eleanor serving what must have been 20 people with her home-made bean soup and salad. Again, Robin was a great host with lots of stories and conviviality. It was great to be a vicarious part of Robin’s family and get to know Dorothy Ann and Bryce AND to especially share in the pride that he took in their development as people, their families and their careers. Great conversations: books, writers, wines, travels, always music, people, events, great dinners- Robin had a world perspective that all of us who knew him benefitted from. Robin’s name does not stand alone, as we all know what a supportive and creative force of nature Eleanor was to his being. It is to her I had my bravos for their wonderful relationship and nurturing. The world will not be the same without Robin. Robin would not have become the man he was without Eleanor. I think I have responded to you privately about our great times in Rochester. Our house, a rental in Toronto was a huge place with a back yard to the Humber (not Humbolt). You were a percussionist at a time when there were few women – Robin thought you were the best. Your devotion to teaching, performing and administration was very much admired by Robin and me. Fran and I are stunned, shocked to have lost Robin, so special. Our final moments with him and you at Beckwith’s home are cemented forever in our consciousness. He lived life with sensitivity, integrity and a subtle sense of humour. I enjoyed those many emails as a result of travels of itinerant accordionists playing with flair on European street corners. He took photos and often recorded sound bites for my opinion. It was his fascination with details of extraneous circumstance that made him so unique. We loved him, will miss him dearly and share your immense loss. Thank you for sharing your thoughts – you are so right. He so enjoyed the conversation with the both of you at the Beckwith’s. What a wonderful person and percussionist. A raw model for anybody wanting to associate with the arts of sound, life, humour, and respect. I will miss him, and I will never forget him. Aadu and I would like to send you and your family our deepest condolences. Robin will not ever be forgotten especially when the performance of Louis Riel by Harry Somers comes in 2017. We met you at the CD launch of the Louis Riel Opera at the Canadian Opera Company several years ago and it was so nice to see Robin again after our work on the percussion. Almost immediately we started to laugh again at the memory of our session tackling the Somers’ score. When I asked for help with the percussion, it was Robert Cram who suggested that I call Robin – after all he was in all of the performances conducted by Victor Feldbrill, knew Harry’s music and probably had to do the percussion traffic patterns in the pit for the first and subsequent performances. He did. After my call Robin spent a good deal of time doing the preliminary look-over, came up with the distribution of the percussion and then we got together to check the whole percussion part(s) starting with the graphic first page. I showed him my version and immediately his eyes shot up: “what on earth is that?” I was using one of the default symbols for orchestra bells; “well, it looks like marbles!” we started laughing. “And the crotale looks like a derby hat!” “Better put legs on those drums.” He liked my version of the anvil though but the sizzle cymbal was really too much: “looks like a space ship or a bean bag target.” “Is that the ‘vase’?” I had a cow bell upside down. “Yes, well it sure looks like an upside down — cow bell.” More laughter. And then he really wanted to talk pencils. It was a Faber-Castell fat pencil, with a 4mm lead, which I had. He enjoyed using it and it was fun to use and doodle. He loved playing and writing with it. More anecdotes about Harry and sometimes of what percussion was like at U of T. I had studied with Russell Hartenberger, the only composer in the class. (That was 1976.) I never missed Nexus performances if they were in Toronto and so Robin and I lapsed into reminiscences and stories. After finally getting back to the score and notation, we agreed that I would send him the corrected version, then he could blow it up on his large screen. Another tangent and more laughter about graphic scores and favourite composers. We both enjoyed the music of Toru Takemitsu; I had done an analysis of November Steps. Robin was curious to know why – why that piece? So I told him that I was reluctant to use Estonian traditional instruments in my pieces figuring I would be labeled an “ethnic” composer, so I was curious to see how someone else would treat traditional Japanese instruments – part of Takemitsu’s heritage and it was unique for the time. Robin had more stories about Toru Takemitsu and it was just a fascinating experience listening to him. I can’t believe he is gone. I sent him the final corrections, changes and in the end the parts along with the full percussion score, just in case anyone else would want to do their own version of who plays what. He also shared with me very early percussion notation, different books on percussion notation, what was in and what was no longer used and we talked about software. I am so grateful for his help in refiguring the whole percussion part for the Riel, I could not have done it without him. It was useful for me as an engraver, editor but also as a composer; it was an invaluable, enjoyable time with Robin. And when we are at the Riel performance, each percussionist will know who helped because Robin’s name is credited on each part. He was so surprised at the gesture but I wouldn’t have had it any other way. I’ll remember how we laughed through the proofing and at the performance it will not leave my mind. I would like to pass on my deepest sympathy to you and your family. It is really touching to read all of the memories posted about Robin and to see all of the lives he has influenced. My fond memories of Robin include all the “road trips” he took us on while at UofT. Driving us to the CADRE events where we met John Pratt and Nick Attanasio; a visit, tasting and performance at Eigensinn Farm where we “jammed” amongst the trees; and going to Peter Olsen’s family farm to record animal sounds which we used in a piece by Mauricio Kagel that we performed with the Percussion Ensemble. Robin went above and beyond for his students and introduced us to ‘worlds’ I am forever grateful to know about. The last time I saw Robin was a couple of years ago when we went to see Maya Postepski’s band Austra perform at The Pheonix. I thought that it was pretty cool that Robin wanted to go out to The Pheonix! Again, it just shows how much he cares about his students, even after they have long since graduated. Thank you so much for opening your door to us during our University days and being such a gracious host. As per your request, I have donated to a musical organisation on behalf of Robin’s name. I wish you strength through this difficult time. He was always ready for an adventure, wasn’t he. Thanks for looking out for him at the rock concert- he was always interested in what his students were up to. We were so shocked and saddened to hear of Robin’s passing – Phil (Nimmons) emailed us to let us know, as we are out of the country. Robin was such a brilliant musician and an incredibly witty man. We have wonderful memories of our times with both of you at the Nimmons cottage, and we have a particularly funny memory of Robin’s hearing Bli Blip by Duke Ellington at one of our performances and his insistence that we deconstruct and analyze the lyrics. He gave so much to the musical world both as an extraordinary musician and as a wonderful teacher. He will be be deeply missed. Please know that you and your family are in our thoughts. We often talked about those wonderful days at the Nimmons’ cottage and getting to know you both. Thank you for sharing your memories and thoughts about Robin. Today is Robin’s birthday – his 79th. The family will gather tonight to toast him and remember other birthdays. But more than that, we thank all of you for the wonderful stories and tributes that have filled these pages. It has been more then I can keep up with but I will be in touch with all of you. I can not begin to tell you what these have meant to me and my family. It has been a few weeks since I learned of Robin’s passing and my thoughts keep turning to the times we shared. Robin and I were best friends in high school. That is, Westmister High School in Westminster, Maryland. We liked to call our town West Monster. We were the iconoclasts of the class of 1957, although never estranged from our classmates. The jocks and brains got along just fine and respected one another. Still, as iconoclasts, we delighted in teasing some of our classmates who were evangelical Christians. This achieved the desired effect, which was an intensive barrage of prayer on our behalf. I have come to respect the power of their prayers since both Robin and I ended up in Canada, a blessed land with a single payer health care system, a more or less polite electorate and a healthy respect for both irony and the arts. Robin became an internationally known percussionist, performer, composer and conductor. I became a humble anthropologist adept at the art of listening. From Westminster we embarked on a variety of adventures. One, of course, was musical. We used to bum rides into Baltimore for Baltimore Symphony concerts. At home we sometimes almost crawled into the huge bass reflex speaker box with a 15 inch Tannoy speaker that my father and I had put together. We’d crank the volume on the “hi fi” and freak out on Berlioz Symphony Fantastique or anything else with an exotic sound, particularly an exotic percussion. From Robin I learned what a paradiddle was and even more or less mastered it in slow motion. At school, Robin was blessed to have the mentorship of Joseph Chalker, the school band and orchestra teacher, back in the days when public schools considered music as important as auto shop or home ec. We were also blessed to have Mike Eaton as our English teacher and “Cosmo” McGill as the journalism advisor. I can still recite the opening verses of Chaucer’s Canterbury Tales, thanks to Mr. Eaton. Robin and I shared a variety of other adventures in our high school years. One of these, that Robin’s friends in the music world probably didn’t know about, was cave exploring. We belonged to the Baltimore Grotto of the National Speleological Society, replete with hard hats, carbide lamps and NSS decals; (dee-calls in American English, deck-alls in Canadian). We used to drive to Mystic cave and others in Maryland and West Virginia near the Potomac River and sometimes to more distant ones in Pendleton County, West Virginia, in which the Grotto had a house where cavers could hang out and talk story. The Matterhorn of Pendleton County caving was Schoolhouse Cave with a 100 foot plus drop into the entrance. We took a close look and declined, perferring to hear about it from the more experienced cavers who had the right equipment and skills. Thus, we lived to tell our tales back in Westmister. Our most extreme adventure was a solo foray into the Organ-Hendriks cave system, the third longest known cave in West Virginia. By then I had a driver’s license and my parents graciously loaned us the family’s Buick Station Wagon with dynaflow automatic transmission (first tested on the M18 Hellcat Tank). One entrance to the cave is known as Hendricks. The other is Organ Cave, a popular commercial cave several miles away. Somewhere, deep within the system, they connect with one another. Our goal was to enter at Hendricks and triumphantly emerge in Organ Cave to the astonishment of the paying tourists. It was not to be, although we probably penetrated several miles into the system. Fortunately, we were experienced enough by then to be confident about our ability to find our way back out, but in this case we had determined to push on until we saw the bright lights of the commercial cave. Far from the entrance was an enormous room, several hundred feet in diameter and about sixteen inches high. This we negotiated by crawling. It led into a series of deep vertical fissures fifteen or twenty feet high and a couple of feet wide. By this time we had been going for hours. We had wedged ourselves between the walls when I dislodged a large rock which fell onto my right foot. We wore boots, of course, but they weren’t steel toed. At that point I completely freaked out. Organ cave was not going to materialize. We had to turn around. Robin stayed calm and helped me and my already swolen foot back down the crevasse and into the gnome room. Several hours later we emerged. It was snowing. We felt like Santa Claus had landed here. We expected a sleigh and six tiny reindeer. We took a motel room. I removed my boot and soaked a very bruised but not broken foot. Robin thought the whole adventure had been great fun. I was not quite so sure until the next morning. We made a good story of it when we got home, even though we had not reached the summit or whatever is the ultimate goal of a spelunking trip. After that we migrated to different sides of Canada. I spied him briefly when I was attending a conference at the Royal York Hotel and there was Robin walking through the lobby. We had a few moments together to catch up. The next time was more consequential, when Nexus performed at UBC in Vancouver and we had a chance to see him in action. After the concert we shared a dinner with Robin and Bob Becker at Raku, a favorite restaurant on 10th Avenue, and caught up on our respective adventures. I last saw Robin and Eleanor, his life-long love, in 2007 at the WHS 50th reunion of the Class of ’57. I hadn’t even thought about going since I live on the BC coast several thousand miles away. Robin offered a challenge; “I’ll go if you meet me there.” Since my sister lives in Bethesda, MD, Jillian and I were able to combine a family visit with the reunion. I discovered that the old East End Elementary School had been converted into a boutique inn so that’s where we stayed. As I remember, Jillian and I got sent to the principal’s office and Robin & Eleanor were in one of the classrooms, maybe even the one I had in fifth grade (grade five in Canadian) with the effervescent Mrs. Vosburgh. The teacher and I used to give each other the giggles so badly that one of us had to leave the room. She stayed. I continued to giggle in the hallway. I never got sent to the principal’s office back then, but finally, in 2007, there I was. I even had the audacity to wear my usual kilt to the reunion. As Jillian and I drove up to the building where the reunion was being held we wondered if we were in the right place. All these old people were milling around. Maybe our classmates had invited their parents, but no, those old people were our classmates. As we got to the door, one of these elders came up to us and sharply asked Jillian, “Who is this?” referring to me and looking incredulously at the kilt. “That’s Robin Ridington,” she replied. The elder responded, “Are you sure?” Jillian replied, “I ought to know. I’ve been married to him for thirty years.” We felt a bit more comfortable when we found a table with Robin and Eleanor. Just as our relationships with our classmates had been accepting in 1957, the shock of seeing us wore off and we assumed our rightful places. Truth be told, we were not teenagers either. Most of our classmates still lived in Westminster. We were the only Canadians. We lived up to the image and took delight in being polite. Since the reunion I kept up a conversation with Robin via e-mail. He gave me his expert opinion of a sample of Dane-zaa Dreamers Dance music I had recorded in the 1960s. I reported on our annual Pender Harbour Chamber Music festival. In January of this year we went to a lovely concert in Victoria by a harpsichord and violin duo, Les Amusements de la Chambre. I found a tribute to them by Robin on their website. I wrote him and as usual he graciously and thoughtfully replied. I’ll continue to think about Robin as I encounter people in the music world whose lives he touched. Fare you well, dear friend. You have been such a strong player – remember the Kagel “Variete”? Robin was so pleased that you were playing. I’d love to see Andrew put it on again – it was really something to remember. Robin never got into that traditional/student relationship. He saw something in a student that he tried to attend to – you experienced it! Robin Engelman, one of the founding members of the world renowned percussion ensemble NEXUS, passed away on February 26, 2016 in Toronto, Ontario, Canada, after a nine-month battle with pancreatic cancer. He is survived by his wife of 55 years, Eleanor, two children, and three grandchildren. Born in Baltimore, Maryland on the first day of spring (and nicknamed for the bird on the windowsill! ), Robin and his family moved to Westminister, Maryland when he was in 8th grade. After graduating from Westminister High School, where he met his future wife in the high school orchestra, Engelman studied percussion and composition with Warren Benson at Ithaca College in Ithaca, New York. After graduation, Engelman performed with the North Carolina Symphony, New Hampshire Music Festival Orchestra, the Louisville Orchestra, the Milwaukee Symphony (where he met NEXUS co-founder John Wyre), and the Rochester Philharmonic (where he met Bob Becker and Bill Cahn). In 1968, he became the Principal Percussionist of the Toronto Symphony Orchestra, a position he held for four seasons. On May 22, 1971, Engelman joined Becker, Cahn, and Wyre for an improvised concert in Kilbourn Hall at Eastman in Rochester, New York. This first NEXUS concert was organized by Benson, who was then teaching composition at Eastman. Russell Hartenberger, and the late Michael Craden, joined the ensemble soon after. “Robin’s inimitable performance style, musical conception, and sharpness of thought and expression helped define the character of NEXUS since our first concerts in 1971,” states Bob Becker. as a performer, composer, arranger, and conductor. Six of his compositions – “Remembrance,” “Lullaby for Esme,” and four of his arrangements of Toru Takemitsu songs (originally written for mixed chorus) – have been recorded by the ensemble. In a 1999 interview, Engelman was asked how NEXUS should be remembered by percussionists in the 22nd century. “With caution!” he replied, eyes twinkling as a smile spread across his face. In addition to his time with NEXUS, Engelman taught percussion at the Eastman School of Music, York University, and the University of Toronto where he also directed the contemporary music and percussion ensembles. He received a Toronto Arts Award and the Banff School’s Donald Cameron Award. Engelman also created pioneering work with Toronto’s New Music Concerts contemporary music ensemble. Robin Engelman’s interest in rudimental and military drumming dated back to 1976 when he obtained a bicentennial field drum from Patrick Cooperman. Robin soon made himself an expert on historic instruments, especially drums and fifes. In 2002, Engelman was the Artistic Director of “The Drummer’s Heritage Concert” at PASIC 2002 in Columbus, Ohio. The once-in-a-lifetime gathering of 230 drummers from all over the world was captured on a DVD available from PAS. Engelman made sure to include representatives from five styles of drumming – ancient, Swiss, Scottish, show band, and contemporary – from the Revolutionary War to modern times. “I was afforded the honor and pleasure of working with and hearing some of the most accomplished field drum artists in the world,” he said. James B. Campbell, Professor of Music at the University of Kentucky, remembers one of Engelman’s visits to the UK campus. “I invited Robin to my home one evening and asked if I could play Warren Benson’s ‘Three Dances’ for him. I had several interpretation questions and since he was a student of Benson, I thought I could get a sound perspective. So we poured a glass of wine and had a fun and lengthy conversation, winding through topics that included Warren, music, teaching, books, wine, travel, and food. “I’ve had so many wonderful times shared with Robin over the 50 years I’ve known him that it would take a sizable volume to relate them all,” shares Bill Cahn. “Without a doubt, Robin was the most memorable personality I will likely ever meet, and in many ways, in addition to being a colleague and friend, he was one of my teachers – both in and outside of music. “One great memory with Robin occurred in August 1984, towards the end of an amazing four-month-long world tour that took NEXUS – along with our 20 trunks of percussion instruments – to China, Japan, Korea, through Canada, to the Netherlands, Germany, Belgium, Denmark, Finland and finally to England, including a solo concert at Royal Albert Hall for the BBC Proms. “On one of our free days, Robin asked me if I’d like to play a round with him at the Royal Liverpool Golf Club, which was as prestigious as it sounds. Off we went with Robin driving a rental car and me frequently reminding him to drive on the left side of the road! At the links, Robin removed his golf clubs from the trunk of the car and was immediately approached by one of the caddies, with whom Robin instantly formed a bond. I didn’t realize that this was a links course and that unless a golfer has played there many times, it would be virtually impossible to know which direction to hit the ball. Not being much of a golfer, I bowed out but tagged along behind Robin and his caddy, soon realizing that the advice of a caddy was absolutely essential to let the player know where and how far away to strike the ball, over many yards of gorse in order to find the fairway. “Robin was at the height of his golf game,” Cahn continues, “and he played the opening few holes well. Since he was playing alone, we eventually caught up with a foursome of Club members, who graciously allowed Robin to play through. As Robin set up the ball on the tee, it seemed to me that the Club members were just waiting for this North American stranger to shank a few balls into the gorse. I really felt nervous for Robin – this was like playing a recital of marimba solos at Carnegie Hall; I can’t imagine being under any more pressure than this situation presented. There will be no formal funeral or memorial service. In lieu of flowers, the family requests people to support an arts organization they love in his honor. Jane and Jim Lawrence Taneytown, Md. Thank you for geting in touch. Actually, Robin and I attended the 50th reunion in 2007 along with Robbins Ridington and his wife. After graduating from college, Robin traveled from orchestra to orchestra until we ended up in Toronto where we have lived since 1968. With Robin’s performing schedule it was difficult to attend reunions. Please give our classmates a “Hello” from me and all the best to you and Jim. It sounds like you had an exciting life together…and I will tell Jim that you were there at the reunion also since we have not missed too many of then after his 20th year. Jim said he remembered that he was very good in music. I will give the classmate a shout out for y ou and if you ever get back to Westminster or Taneytown where we live, look us up!! I was so saddened to learn of Robin’s death. He was a teacher, mentor, and friend to me for so very long. His passion for rudimental drumming made an indelible mark on my career as an educator and performer, and I am eternally grateful for that. Every moment I spent with him was a learning experience for me. You and your family are in my prayers. Thank you Dylan for your kind words. My son and his family and I are off to Chicago on Wednesday for a concert of Robin’s music at Northwestern led by She-e Wu and her percussion ensemble. Robin saved so many things – recital adjustications, programs, – lots of memories for all of us. All the best to you and your family and keep in touch.